AppStudio for ArcGIS lets users build native apps once and deploy them across multiple devices and platforms. 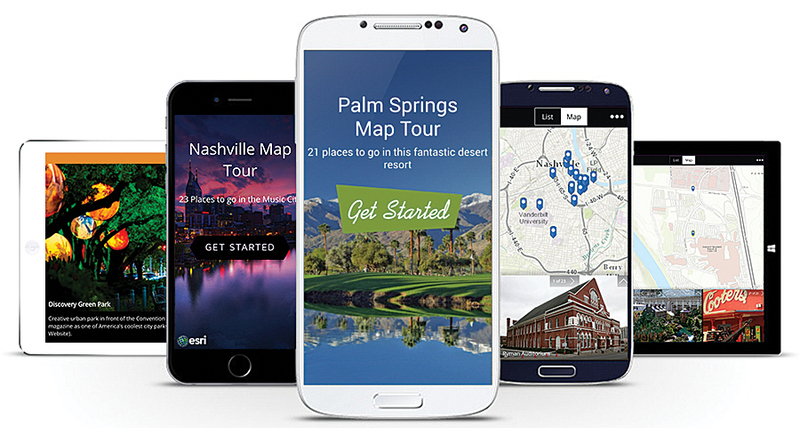 ArcGIS users can now easily build native apps that run on any device using AppStudio for ArcGIS, a groundbreaking tool from Esri. Build an app once, and it runs on Android, iOS, Windows, OS X, and Linux devices. Already using ArcGIS? Convert your maps directly into native apps that are ready to use. These beautiful, simple native GIS apps can be shared with the public through all popular app stores or securely within an enterprise. Companies and organizations—particularly cities and local governments—need to broaden their reach and engage community members with useful content to promote the good work they do. What if, for example, there was an easy way for residents to report streetlights that have gone out, share and view popular dining spots, or find mountain biking trail maps? To make these things accessible, organizations need to expand their web presence into the Google Play, Apple, and Microsoft app stores. This can be challenging in the face of tight timelines, restricted budgets, and scarcity of GIS developer resources. 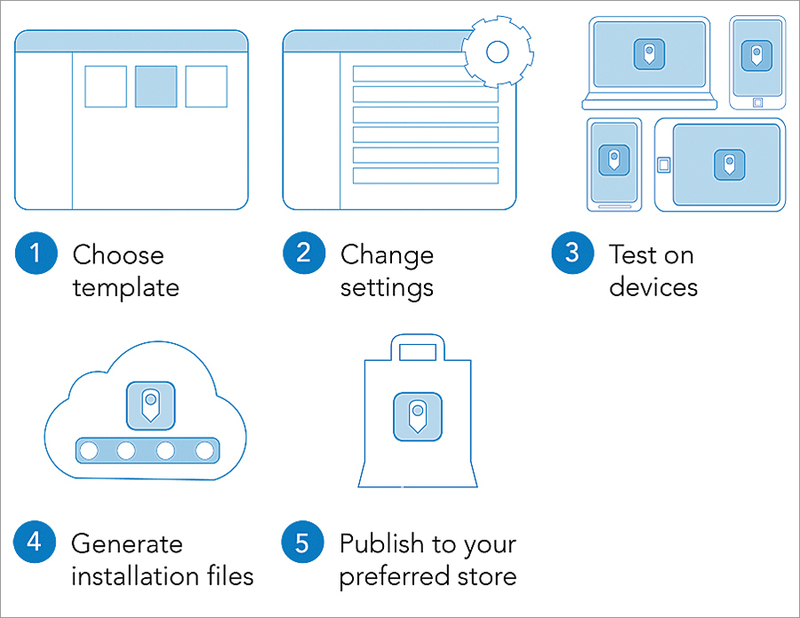 AppStudio provides a cost-effective way to create and distribute apps to the public. Organizations can leverage their existing GIS work and exploit the developer capacities they already have. AppStudio was designed to enable anyone with GIS skills to configure out-of-the-box templates; no coding is required. After using a step-by-step wizard to build an app, users check a box for each platform they want the app to run on and AppStudio for ArcGIS automatically generates the installation files for all selected platforms. That said, if an organization wants to take a deeper dive with developer tools to customize apps or build them from scratch, AppStudio comes with an integrated development environment and provides the source code for its templates, which developers can use as a starting point. GIS managers under pressure to deliver GIS apps and data quickly can use AppStudio to let their departments focus on what’s important—sharing their work—rather than worrying about app development. Whereas GIS departments previously had to build a separate app for each platform they supported—one for iOS, one for Android, and one for Windows—they can now build one app for all platforms. After using a step-by-step app building wizard, users check a box for each platform they want the app to run on. AppStudio then automatically generates the installation files for each of the selected platforms. Organizations also have the option to share apps internally only. While this enables GIS departments to limit app distribution altogether, it is also a way for them to do centralized testing or debugging before sharing new apps more widely. AppStudio makes GIS developers much more efficient. Being able to produce apps that function across multiple devices is useful now that more and more organizations are letting employees bring their own devices to the workplace. Additionally, AppStudio gives developers options for customization. They can either dig into the templates that come with the tool or start coding from scratch. Developers can also include advanced GIS functionality by bringing into play device hardware such as graphics processing units (GPUs), RAM, cameras, microphones, and accelerometers. AppStudio gives power back to GIS organizations. No longer constrained by having to create five separate apps for five different devices, organizations can now build apps as quickly and as customized as they wish and share them as widely—internally or externally—as they want. By allowing organizations to further leverage their investments in ArcGIS, AppStudio lets even more people benefit from the valuable work being done by GIS departments—on any device. Learn more about AppStudio for ArcGIS at appstudio.arcgis.com. 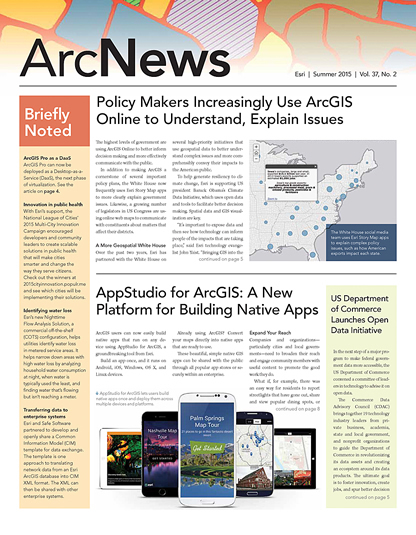 Find out all the details about the July ArcGIS Online update at links.esri.com/arcgisnew.